With 2.5 billion people expected to move into urban areas with the next few decades, we’re going to need to construct over 10,000 buildings a day to house them. Now, imagine the environmental impact of all these people and all this construction. Did you know that 30% of all waste going to landfills is created by the construction sector? Even worse, buildings today are consuming 40% of our energy and producing a full third of GHG emissions. Not only must design and construction be faster and more efficient to keep up with demand, buildings must become far more energy efficient. For everyone involved in the design and construction of buildings, Building Information Modeling (BIM) is increasingly being adopted worldwide to help improve productivity while reducing errors and cutting costs. BIM is also helping design more efficient buildings by integrating Building Energy Modeling (BEM) at the design stage. In this two-post series, we’ll first look at the advancements that BIM technology is enabling. In my second post, we’ll see how – with the support of many industry stakeholders – energy modeling and data integration promise to push the envelope of efficiency significantly further. In the mid-1980s, computer-aided design (CAD) helped digitize the processes of architecture, engineering, and construction (AEC), making them more productive. In the early 2000s, BIM enabled another leap forward. Beyond using 3D modeling to facilitate structural design, BIM makes all information more accurate, accessible, and actionable by all parties though a collaborate workflow. Architectural, mechanical, and electrical information is included in a layered structure, which can also provide dimensions of time, cost, and facility management. This improves accuracy, avoids duplication, keeps all stakeholders on the same page, and supports sequencing of construction steps to improve efficiency. Modular prefabrication and ‘design for manufacture and assembly’ (DfMA), supporting higher productivity and safety, while saving money, materials, and time. Increasingly accurate energy modeling, enabled by increasing levels of detail integrated into the BIM process and models. Integration of real building energy performance data, revealing how a building performs under actual operation conditions after construction to help inform future decisions. Generative design that tests and learns from multiple iterations of a solution, to improve design workflow and efficiency. Originally, the focus of BIM has been to create a single digital model that allows for better coordination of design, simulation, and construction of a building. However, that same model generates a collection of ‘digital twins’ of the building. Each twin is focused on a different purpose, such as digital manufacturing and construction, energy use, asset management, or facility management. In this way, digital twins help BIM reach beyond the design and construction process to supporting the operation of a building after construction and commissioning. A BIM model and its digital twins are made up of digital ‘objects’, essentially all the items that go into a building, from architectural pieces like walls, doors, and windows, to components needed for the electrical and mechanical systems. Each object provides information about the characteristics of that component, from its dimensions, to its cost, to its operating characteristics. From this information, a BIM system develops a multidimensional model. Of course, the general architecture of the building is defined in detail. But there will also be a supporting model for the plumbing and heating, one for the electrical infrastructure, and one for energy performance. The more information that is provided to the BIM system, the more accurate and useful the final ‘as built’ model and its digital twins can be for use in supporting the operation of the building. With BIM systems enriched in this way, the digital twins will become powerful resources for stakeholders from facility and maintenance managers to asset and energy managers. Not only will it be easier to locate technical equipment in a building, each will include important data on its operation, with diagnostics, alarms, and performance history. With more complete energy-related data integrated, the model will also be able to accurately report on consumption per zone, floor, tenant, or equipment to help in allocating and optimizing costs. Think of this as the ultimate convergence of the physical and energy aspects of a facility within a single, unified view. In my next post, we’ll have a closer look at some of the steps that are still needed to make this transition a reality. 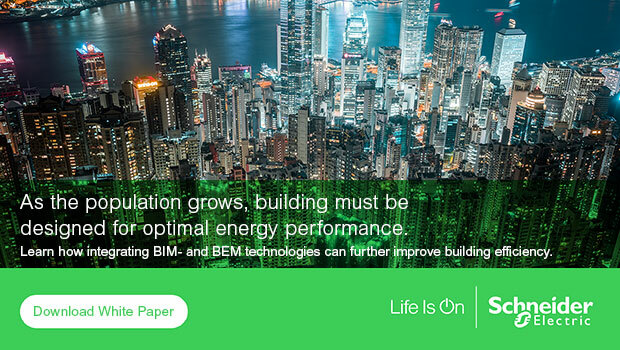 Schneider Electric is supporting these efforts by making more product specifications available in BIM-compatible formats, and partnering with BIM developers like Autodesk to enhance building energy modeling with measured electrical system data. For more information on this topic, download the white paper “Bridging BIM and BEM: the path forward to more efficient building design and operations”. Steve Butler is currently Senior Industry Strategy Manager for MEP at Autodesk, where he has worked in various capacities for the past 14 years. He has enjoyed a varied career in MEP engineering and design, working for consultants, contractors and manufacturers.